Do you have an idea what technique was used to produce the stippling effect? Is this a common one for Alma Tadema? I noticed that too, and I don’t know. I do think it looks similar to the stipple technique used by Victorian watercolorists, which I believe to be essentially a drybrush technique. 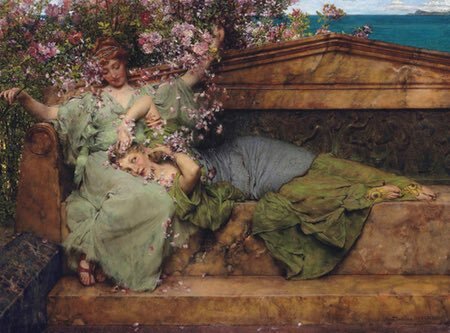 I haven’t noticed it in many other Alma Tadema paintings, but they’re not always reproduced in enough detail that it would be visible.